***CHECK OUT OUR STORE! - Click on the blue Window Garden link at top of page*** FOOLPROOF - It's self-watering! The handy water level indicator let's you know when and how much to water you're indoor house plants. Watering is reduced to weeks instead of days. Aquaphoric Planters work great for all plant types, flowers, herbs vegetables, tropical foliage, succulents, African Violets and seed starting. PLANTS LOVE IT! - And it'll show with lush growth and more flowers. The unique passive hydroponic action creates the ideal balance of root zone oxygen and water. Plants grow and thrive because plant roots are able to sprawl and breathe within the planter container. 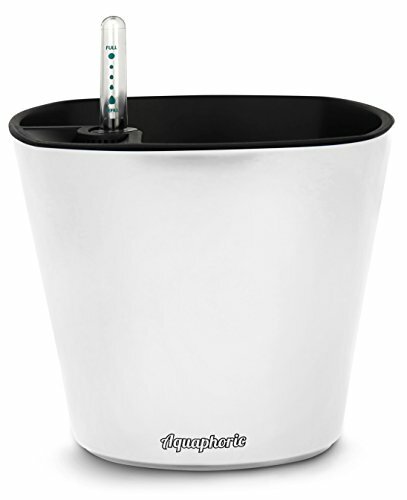 Stop over and under watering your plants, Aquaphoric planters are the modern way to care for houseplants, it's easy. CONVENIENT - Includes 2 quarts of Fiber Soil so you can get planting immediately. Superior growing medium because roots breath. Fiber Soil contains minimal nutrients. You'll need fertilizer to keep your home garden growing lush and vibrant. LOOKS GREAT! - Sleek lines and vibrant colors are sure to compliment any home, apartment or condo. Choose a decorative pot color that compliments your plant or your home décor. IMPRESSIVE GARDENING GIFT - Houseplants are good for you, plus they look great. Why not give the power of plants to someone you care about? It's easy to grow plants with an Aquaphoric planter. Anyone can do it. If you have any questions about this product by Window Garden, contact us by completing and submitting the form below. If you are looking for a specif part number, please include it with your message.